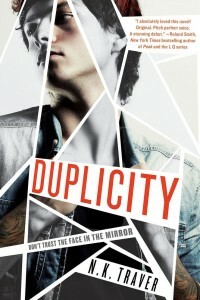 That’s a great opening line and it’s on the back of Duplicity, a YA cyber-thriller by N.K. Traver. Find out how you can win a copy at the bottom of the interview. BELINDA: What is YA science fiction (sci-fi) to you? N.K. : YA sci-fi is about exploring current or future technology from a teen standpoint–specifically, as technology that can be influenced or changed. BELINDA: What drew you to the genre? N.K. : I kind of fell into it by accident. I’ve always had an interest in technology and the hypothetical ways it could affect our future, but I didn’t realize that was the direction Duplicity was headed until it came time to work out the explanation behind Brandon’s moving reflection. I didn’t want to go with a full fantasy bent, so I steered it toward a technological explanation. BELINDA: Do you think there is a difference between YA sci-fi and that which is marketed at adults? N.K. : To me, I think they’re pretty similar, especially as far as theme. I think there’s great crossover appeal for both age groups since the uniting factor remains the same: how technology might go wrong, or how it might go wrong in the wrong hands. BELINDA: How much of your background as a programmer influenced the world you built in Duplicity? N.K. : Almost all of it. The entire world behind the mirror in Duplicity is influenced by my understanding of computers and what they would be capable of–with a few liberties taken on future tech, of course. BELINDA: As a programmer, are there things that authors get wrong that bug you? N.K. : Most authors do their research when it comes to programming, but I will say that a star dies every time an author makes programming an easy skill to pick up or makes it some kind of god-power – i.e., a character who’s dabbled in website hacking suddenly knows how to hack everything from FBI vending machines to NASA launch codes. BELINDA: What are a few of your favourite YA sci-fi books? N.K. :I enjoyed The Silence Of Six by E.C. Myers, and I also really enjoyed All Our Yesterdays by Cristin Terrill and The 5th Wave by Rick Yancey. As a freshman at the University of Colorado, N.K. Traver decided to pursue Information Technology because classmates said “no one could make a living” with an English degree. It wasn’t too many years later Traver realized it didn’t matter what the job paid—nothing would ever be as fulfilling as writing. Programmer by day, writer by night, it was only a matter of time before the two overlapped. 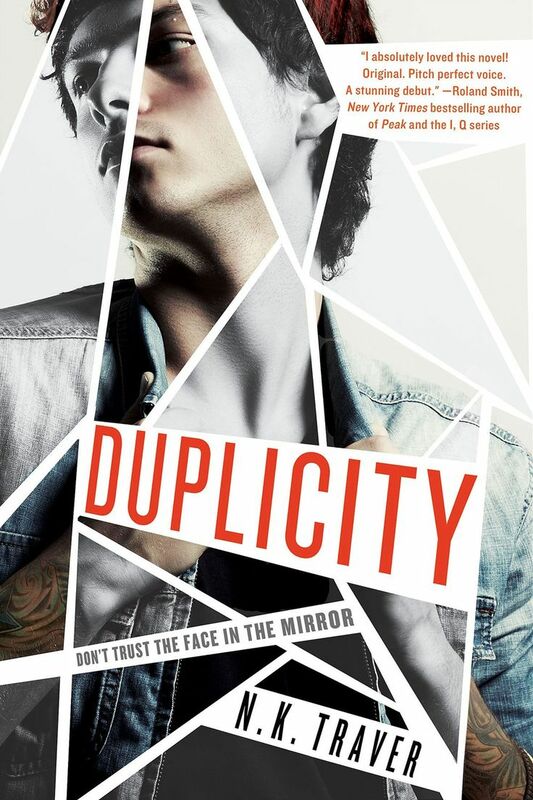 Traver’s debut, Duplicity, a cyberthriller pitched as Breaking Bad meets The Matrix for teens, was named one of the ALA’s Quick Picks for Reluctant Readers in 2016. Find out more about N.K. Traver on her website or follow her on Twitter. Win a copy of Duplicity, along with six other awesome YA sci-fi books, in our giveaway running from 8 April 2016 to 10 April 2016. Sign up to be notified about this and future giveaways. 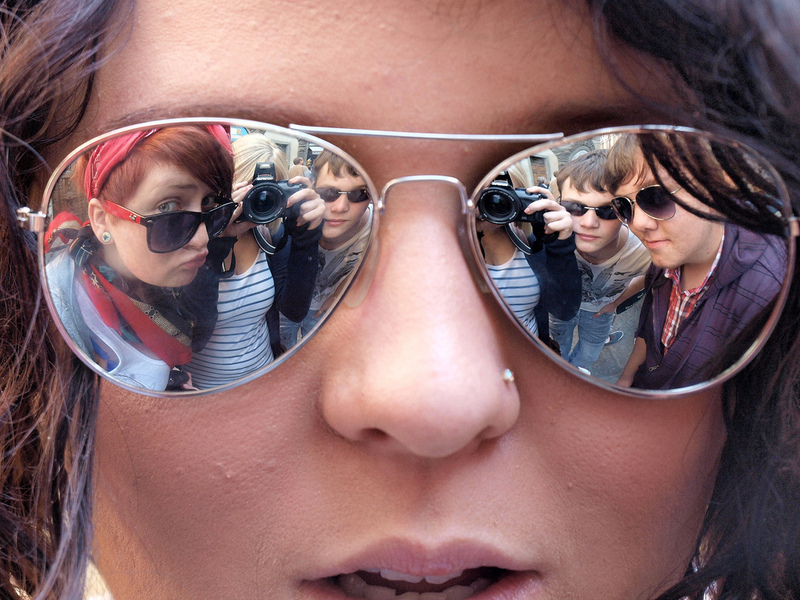 Feature image courtesy of Chloe Blanchfield (via Flickr). Used with a Creative Commons licence.